Wenona Demetrius Johnson, originally of Clio, SC. 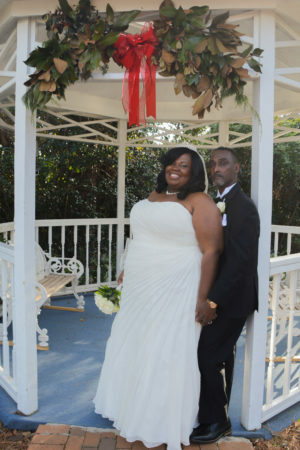 the daughter of Barbara Ann McCrae & the Late Freddie Johnson and Johnny & Juanita White and Jeffery Glenn McCall, originally from Bennettsville, SC, the son of Vance McCall, Jr. and the Late Marie Brooks were united in marriage on Friday, December 23, 2016 in the chapel at Wedding Chapel by the Sea in Myrtle Beach, South Carolina. Rev. Pam Muise officiated. The couple will honeymoon in Las Vegas, Nevada before returning to Bennettsville, SC where they will reside.